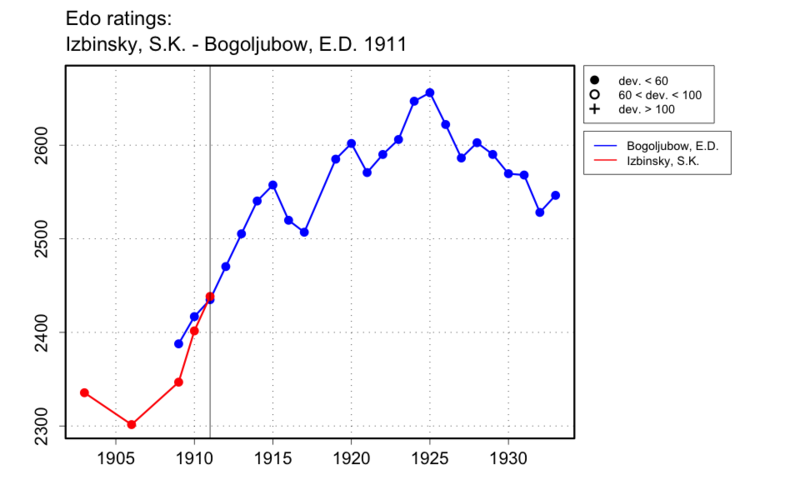 Di Felice gives Bogoljubow's opponent in two matches in 1911 as 'Izbinsky, A. ', but in his index, he lists the page number of these events under both 'Izbinsky, A.' and 'Izbinsky, Stepan Konstantinovich'. This suggests that there was some confusion over initials and that these matches might have been played by the latter Izbinsky. No other reference to 'Izbinsky, A.' appears, so I will assume it was S.K. Izbinsky who played Bogoljubow.